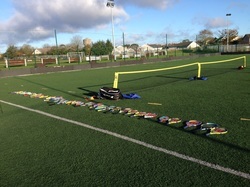 The Big Hit Tennis Academy runs tennis courses in Primary and Secondary Schools in the Leinster Region. These courses can be run as after school extra-curricular activities or alternatively, as part of the PE programme. The classes are carried out in the school yard, or in the school hall. We provide all the equipment needed, portable nets, throw down lines, racquets, balls etc. The tennis classes can also be taught as gaeilge. For the younger age groups we use balance, co-ordination and agility games and exercises to help build a foundation for all sports, as well as providing an introduction to the basic technical and tactical elements of the major strokes in tennis. For the older age groups we teach the proficiencies of tennis in a fun and exciting way. Please contact David on 0878166525 for more info.